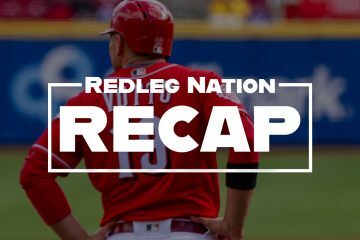 The Reds as currently constructed arenÃ¢â‚¬â„¢t very good. IÃ¢â‚¬â„¢m sure youÃ¢â‚¬â„¢ve noticed. Obviously, the pitching must get better, and with all the young, talented guys both in the big leagues and minors, we have reason to believe it will. In fact, weÃ¢â‚¬â„¢ve already seen quite an improvement in the bullpen with the additions of Raisel Iglesias and Michael Lorenzen. We shouldnÃ¢â‚¬â„¢t kid ourselves though; the offense has struggled as well. The Reds currently rank 20th in runs scored and 28th in runs created (wRC+). TheyÃ¢â‚¬â„¢ve scored fewer runs than the Twins, one of the few teams with a worse record than the Reds. The poor to mediocre offense has many causes. The Reds surprisingly (to me) rank 19th in homeruns and 27th in slugging, so they could add some more power to their lineup. Four lineup regulars have hit well below league average this season. But maybe the biggest problem is one that has plagued them for several years now. The Reds have an on-base problem. The Reds team .300 OBP is 29th in all of baseball. If you donÃ¢â‚¬â„¢t think thatÃ¢â‚¬â„¢s a problem, consider that the top five teams in runs scored are also in the top five in team OBP with a slightly different order (As of Sunday afternoon). The Reds are 28th in hits and 24h in walk rate. An average major leaguer walks at an 8.3% rate so far this season. As you might have guessed, only one Reds player has a walk rate above that: Joey Votto. Adam Duvall, Billy Hamilton, and Brandon Phillips all have walk rates at 6% or under, with Phillips posting a paltry 3.6% BB%.Of course, teams need to do more than just get on base a lot, but it is a vital part of scoring runs in the long term. In 2016, an average major leaguer has reached base at a .326 clip. The Reds have one player with a minimum of 250 plate appearances with an above-average OBP: Joey Votto. This problem isnÃ¢â‚¬â„¢t new. The Reds ranked 29th in team OBP in 2014 and 19th in 2015. The last time they were in the top half of the Major Leagues in team OBP, they made the playoffs in 2013. That season, they ranked sixth with a .327 OBP, which was helped by having both Shin-Soo Choo and Votto in the lineup. Getting on base more is an obvious need, and players like Duvall, Hamilton, Eugenio Suarez, and if he ever plays, Jose Peraza, need to develop better on-base skills. If at least a couple of them donÃ¢â‚¬â„¢t, the rebuild will take quite a big hit. But there is seemingly some help within the system at various levels as the Reds have drafted several guys with strong approaches. Leading the way are the Reds two best hitting prospects since Votto and Jay Bruce came through the system: Jesse Winker and Nick Senzel. 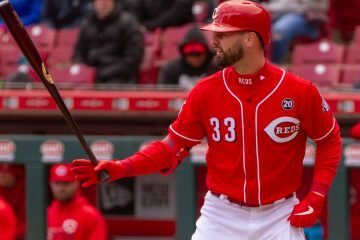 Winker could join the Reds in a week or so if Bruce is traded. In a stark contrast to most of the Reds current roster, he has walked more than he has struck out in his first half season in AAA. His walk rate is over 13%, helping him an impressive .385 OBP. Winker can likely get on base right now in the Major Leagues. And he continues to mitigate power concerns, which I thought were silly anyway, by slugging .555 since May 31th (25 games) with ten doubles. His OPS is 987 during that time. Scouts believe he may develop into a 20 homerun a year hitter, but even if he doesnÃ¢â‚¬â„¢t have elite power, his on-base skills will help the next winning Reds team immensely. Side note: there is ZERO reason Winker should be batting fifth in the Bats lineup most nights. ZERO. If he isnÃ¢â‚¬â„¢t batting 1-3 every day, someone needs to get Delino Deshields on the phone and make sure it happens. Who bats arguably their best hitting prospect that far down in the lineup? As you may have heard, the Reds drafted Senzel #2 overall this season. Scouts made much of his advanced approach that helps his impressive hit tool play up even more. He walked almost twenty more times than he struck out in his senior season at Tennessee, helping him post a .456 OBP. Since being promoted to Dayton a few weeks ago, Senzel has taken off. He has a .333/.435/.536 slash line with twelve walks, fourteen strikeouts, and a 182 wRC+ in 85 plate appearances. A fellow baseball enthusiast and I went to see Senzel play in Dayton on July 17th, and while Senzel didnÃ¢â‚¬â„¢t record a hit, I came away extremely enthusiastic about him. He went 0 for 3 with two walks, making a loud out on a rocket that the leftfielder snagged. But what excited me about him was that he seemed in control of every plate appearance. Senzel refused to swing at bad pitches and forced pitchers to come to him. As Doug Gray noted in his scouting report on Senzel, he doesnÃ¢â‚¬â„¢t tend to miss pitches in the zone. He still reached base twice and could have had a double if not for some poor luck. If these are his Ã¢â‚¬Å“badÃ¢â‚¬Â days, the kid might be alright at this baseball thing. The day after I saw him, Senzel went 4 for 5 with a homerun, triple, and stolen base, showing off power and potential above-average speed. He has outclassed the league to date and will likely finish the year at High A Daytona. Senzel still has several levels to advance through, and it will be interesting to see how his skills translate at higher levels, but the on-base ability has been impressive. The Reds have a few other high OBP players in the minors to help out in the future, but Winker and Senzel have the most talent and project as everyday players and potential All Stars. Both players rarely get themselves out by expanding the zone and do damage on pitches in the zone. 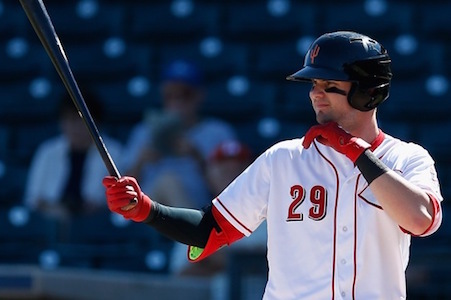 After watching the swing happy Reds for the last three years, Winker and Senzel are a breath of fresh air. A 1-3 combination of Winker, Senzel and Votto has me giddy. Unfortunately, whoever is managing at that point will probably put Peraza and Hamilton up there instead. In fairness, I don’t think there is a manager in the game that would put those three 1 – 3 in the order. I’m not saying it’s wrong to do so; just that the old school mindset is deep in the game still. If small market teams don’t look for advantages, they will never win consistently. We cant play the same way as teams that have 3-5 times more $$$ to sign prospects, free agents and keep them around. You would think that after Billy Bean,Theo and the rest of the “stats guys” keep crushing the “old school” guys inevitably the “new school” will become the only “school” still around. Heck, a lot of the great “old school” teams were actually ideal high OBP teams! So, it’s not even old-school versus new-school in my opinion. It’s knowing what hitters to target and knowing that plate-discipline, the ability to recognize pitches swinging at good ones and taking bad ones, is a very important skill. Winker 2, Senzel 3, Votto 4. Breaks it up as L/R/L, and that’s probably the order with increasing power 2-4. Maybe go Senzel, Votto, Winker, to take advantage of Senzel’s good base running. Ideally, you find another high OBP guy to hit leadoff in front of that. By 2020, that could maybe be Taylor Trammell, but 2020 is a long way away. Sounds like a job for Votto. Hamilton with 2 hits AGAIN last night may just be that lead off guy. now up to 256, he is doing much better at the top of the order and hitting liners and ground balls. I really do not even care what order they are in. The Reds move from a HR dominate offense into a hitters offense. He might only lead off an inning once in a game, though. If those 3 guys are in a lineup together and all getting on base at the high percentages we expect, I would put them first, second and third in the lineup with the least power hitting first and the most power hitting third. Sort the rest of the lineup out from there. The Brewers, Reds, Padres, Astros and Pirates are the top 5 teams in stolen bases. They are ranked #26, #20, #16, #13, and #15 respectively in total runs scored. The Red Sox, Cubs, Rockies, Giants and Blue Jays are the top 5 teams in On-Base-Percentage. They are ranked #1, #4, #2, #14, and #5 respectively in total runs scored. Seems to me that speed on the bases is not as important as just getting on base in scoring runs. The 2 teams with the most stolen bases out of their lead-off hitter are Milwaukee and Minnesota. They are ranked #26 and #18 in total runs scored. The Red Sox, Rockies, Cardinals, Cubs and Blue Jays are the top 5 teams in total runs scored. They are ranked #9, #11, #29, #18, #23 in stolen bases by their lead-off hitter. So it also doesn’t seem like speed at the top of the line up is that important to scoring runs. I would hope that information like this would have more teams favoring on-base-percentage rather than speed especially at the top of the lineup. Get on base. Hit with power. Not a complicated formula. The correlation between team OBP and runs scored is tight every year, much tighter than batting average and runs scored. I wouldn’t be surprised if SB and runs scored aren’t even positively correlated. sample size. What does the past 100 years tell you about having speed demons at the top of the order? Top 5 teams in total runs scored are the Yankees, Red Sox, Rangers, Tigers and Rockies. They are ranked #4, #19, #7, #29, and #10 respectively in total stolen bases. In stolen bases by just their lead-off hitter they are ranked #14, #8, #16, #29, and #6. They are ranked #2, #1, #6, #3, and #5 respectively in on-base-percentage. In on-base-percentage by just their lead-off hitter they are ranked #1, #18, #5, #11, and #8 respectively. It looks to me that over the last 10 years on-base-percentage, especially at the top of the lineup, is more important to scoring runs than speed. If anyone wants to look at the numbers over the last 50 or 100 years they can. I’m guessing you’ll see similar results. The last 10 years is enough for me to conclude that I would focus my offense on players that make the fewest outs, i.e. have a high on-base-percentage. Of course you’re right. But if the OBP lead-off guy is fast, that’s even better. Obviously if you can have peak Ricky Henderson at lead-off that is what every team wants (1982: .398 OBP and 130 steals or 1983: .414 OBP and 108 steals). The Reds options next year though are likely to be Hamilton or Peraza with average at best on-base skills and crazy speed or Winker with little speed and likely a high OBP. Assuming Winker can handle the pressure of the lead-off spot in his rookie year he would be my choice. If Senzel continues to show a high OBP with some speed on the basepaths then he might be the best option for lead-off. He has a .430 OBP with 9 steals in 21 games in Dayton. Thanks Nick the data you presented supports what I and others have said in that we can’t hit or more importantly get on base.We have a bunch of hackers and unless we hit homers we don’t win.We start swinging in the hotel on the way to the game and never let up.Good pitchers eat most teams alive but what they do to us is unbearable because at times they just throw it close and we get ourselves out.For us to compete next year and beyond we have to have guys who can get on base and we have to make that a priority at all levels of the organization.Maybe just maybe Winker/Senzel and others will start a new wave of high OBP players coming through our system.It sure would be nice to see 7 or 8 pitch at bats rather then 3 outs on the same number of pitches. Twenty HR’s for either Winker or Senzel is being overly optimistic. Thus the need to keep Bruce. If Bruce is not traded and stays, then Winker, Senzel and Votto give Duvall nowhere to play. Maybe Duvall and his blustery .285 OBP should be shopped, not Bruce. Overly optimistic? Nobody that I’m aware of who gets paid to evaluate has suggested that either guy won’t be able to hit anything less than 20 HRs a season. I’m just wondering what your conclusion is based on. Winker, 67 games at AAA in 2016, 2 HR and a .086 ISO. For comparison’s sake BHam has a .096 ISO this year. Winker is in probably the 10-12 HR neighborhood. Senzel probably is in the 15 neighborhood. Which won’t be bad for them. 20+ is pushing it a little for them. What I would rather see from both of these two would be their runs scored. If these two can become 100+ R’s players along with Votto, that can solve many of the Reds offensive problems. You could be right of course, but I still see 15-20 for Winker. Last year in AA, he struggled with everything, including power, until June and had a .180 ISO from June 2nd on while hitting eleven home runs in just over 350 plate appearances, a pretty good pace. This season, his power numbers are trending in the right direction as well. Not hitting a ton of homers yet, but I believe some of his doubles (he has hit a lot of them lately) will eventually become homeruns, especially at GABP. Again, you could be right. I just put more faith in his minor league career and what the scouts are saying that a couple months at AAA where he also suffered a wrist injury, something that has been known to zap some power. Winker did hit 13 HR in 2014 at A+ and 13 last year at AA Pensacola. Something other than the wrist injury has his power way off. Hopefully he regains the power he did have. I hope I am wrong, that means better players and a better Reds team. Down the road in a few seasons, maybe they can get to 20 HR’s, as they grow into more accomplished hitters. I just don’t see it early in their ML careers. I’m still seeing a kid that is growing and should reasonably be expected to gain more power as he enters his mid-20s. He can square up a ball, the power will come. As for Senzel, it’s early of course, but nothing from his college days and short Milb career suggest he’ll be a sub-20 HR hitter. Kid’s got some strength and a good frame already. All of this is to say that there is no reason to keep Bruce just on some guess that these two won’t be power hitters. If they keep their on base skills as they advance upward, they’ll fill the hole left by Bruce while being less expensive and, of course, younger. I’d be really surprised if both players don’t eventually hit 15-20 homers. Who cares if they hit 20 HR if they get on base around .380-.400. But, yes in this stadium they will hit 15-25 HR without much effort. Bruce will probably be a .240/.280/.466 hitter in 3 years for 18-20 million a year. That ain’t helping much. The Reds play in GABP…not PETCO. I see 18-25. This is refreshing. Let’s hope that management doesn’t somehow botch their development. The best thing a player can do is not get out! I’ve heard that one point of OBP is more valuable than one point of SLG. In general, you’re better off with a high OBP than a low OBP. It’s a rare skill that is hard to develop and extremely expensive to buy on the open market. The Giants have won 3 of the last 6 titles and their OBP rankings were # 19, # 8 and # 18 respectively. The Cardinals had the best record in baseball last year and they’re OBP was #12 and they scored 6 more runs than the 98 loss Reds. Is OBP important? Of course, but it depends on how your team is structured. If the Reds ultimately morph into a pitching-defense oriented team….and most of their resources go in that direction…then OBP is less important. Of course, right now, they’re bad at both. Hah. Senzel’s 12 BB since moving to Dayton is only two less than Phillips on the whole season. Senzel has 14 now. He and Phillips are tied. Winker and Senzel are definitely the type of hitters we need! Suarez had 11 walks in June but he K’d 33 times so that negates it pretty much! Duvall is only hitting .219 in July but 8 walks puts his July obp at .311! Hamilton has a good idea up there but so little pop that the pitchers just attack him. Same think with Peraza from what I’ve seen although you can tell Peraza isn’t looking to take anything. He does show pretty good hand-eye coordination to foul off a lot of tough pitches so there is hope! Hopefully they can eventually just change the culture one player at a time. Look at the Cubs….even underachieving guys like Jorge Soler have an obp 90-100 pts above their batting average. Votto, by himself, obviously isn’t rubbing off but maybe 3-4 guys with a good approach can turn their obp around! While I agree that Winker shouldn’t hit 5th, where a player hits in the minors is as close to irrelevant as something can be. Also, the Reds do communicate with their affiliates and mandate playing time and whatnot for some players. I only think it’s ridiculous because he would be getting more plate appearances batting 1-3. Not a crazy amount more, but more. The order doesn’t matter but the repetitions do. That’s the biggest issue I have; get the kid as many PA’s as possible, especially since he missed time with an injury. I don’t need Louisville to optimize their lineup or anything; the top prospects should get the most plate appearances. He was also pinch hit for in the 8th vs. a lefty reliever. Just more examples of an organization fraught with incompetence. All Reds affiliate coaches are Reds employees. The stadium and team belong to the local ownership, but all baseball related decisions are managed by the Reds. Another relevant side note: At 22, Winker is extremely young for AAA while still managing to produce. Also, Slugger Field (unlike GABP) plays pretty big. The wind tends to blow in off the river, especially in left where a lot of Winker’s hardest hit balls go, so the park is probably suppressing his power a little. Not that we shouldn’t hope for it to be higher, of course. Jocketty: “The top 5 teams in OBP are the top 5 teams in runs scored?? I dont get the furor over whether he gets on base .280 vs .320. I think it averages out to be, roughly, once more on base per week. Right? Of course less outs is mo’ better. But a gold glove CF with 80 speed/.280 obp can be carried in a lineup. Easily. Unfortunately, the Frazier and Chapman mismanagement has hurt our rebuild for 2017 and 2018. However, it does appear the early performance by Senzel is a reason for optimism, as is the continued progress of Winker. I am one that believes if the Reds protect Votto over the next 5 years, he can maintain productivity longer than the usual player. He is obsessed with preparation and plays first base. The Reds really need to focus on advanced and progressive ways to maintain his durability the next 5-6 years. There is talk of MLB dropping 8 games to 154 in the next collective bargaining agreement, which would be a huge start and to also give him another 10-15 games off a year. JV at 140 games a year could play a long time. One more optimistic piece- the top position player in next years draft is a center fielder from Vanderbilt who could be the missing piece to the puzzle to the rebuild from a position standpoint. The Reds will definitiely have a top 4 pick. many of you seem to think having 7 guys striving for ball 4 is going to be a fun game to watch. Not me. Is it fun to win? Of course it is but not at a snails pace when there are so many other things plying for the time. If a ballgame is going to take 4 hours every night due to guys “working the count” I doubt that sort of strategy is goinng to work to fill the seats. I understand the logic of patience and having an eye for the strike zone. but if you have guys going up to the plate simply to walk then I don’t think that they no the Reds will find long term success in such an endeavor. I am still not convinnced that half of Votto’s walks are earned as a statistical award for his efforts. Why are errors by fielders still considered outs but a walk is now given as 100% batting effort? If the pitchers goal is to get a batter out and instead the pitcher gives up a walk they why is that not also considered an error on the pitchers part? Strip out the intentional walks and the 4 or 5 pitch at bats in the very least there is no way that those should be awarded to a batter for any effort on his part simply because he put the bat on his shoulder. Are we reading the same articles and comments from this site? I’m not seeing anyone advocating that hitters should go up to the plate looking for the walk or “striving for ball 4” as you put it. Might that be an intentional mischaracterization you’re making? If you don’t like long games, that’s your opinion. But I’d rather watch some hitters that swing at good pitches to hit and lay off the junk. It tends to lead to better offense. That’s fun. And it certainly doesn’t hurt the team’s chances to win. Winning’s fun. I don’t see the problem here. This isn’t responsive to your original gripe and my point above. You objected to people here advocating that hitters strive for ball 4. The inference being that people didn’t care if they got hits. But no one is saying that here. And I’m not even sure where you’re trying to head with your response. Pitcher v. hitter is a cat and mouse game. Call walks a pitcher error if you like but a hitter should force the pitcher to throw hittable pitches by laying off of junk pitches or pitches designed to induce easy outs. Sometimes a pitcher intentionally pitches around a hitter. That’s particularly true if a hitter has proved himself to be dangerous and not likely to get himself out by swinging at bad pitches. That’s a skill and a very desirable one. We should want players with that skill playing for the Reds. It’s as simple as that. Dan: OBP measures not just walks, but getting on base, and part of the value of being selective is that, over time, it may force pitchers to throw a hitter more strikes, some of which will be more hittable than the pitches that free-swingers mostly see. I doubt that selective hitting skills would result in a parade of walks, because pitchers won’t continually put people on base. Right… having good pitch selection is crucial to getting good pitches to hit. If a pitcher knows a player, and really, in the Reds case, a team doesn’t demonstrate very good plate discipline, what incentive is there to throw a true strike when low and away accomplishes the same thing? So, Dan, if a team collectively is focused on plate discipline, it also likely more likely that the opposing pitcher is going to want to nibble all day, and will have to pay more of a price for base hits when there are already two guys on board. “isn’t” going to want to nibble all day (because the walks will haunt). And, I think a fair argument can be made that keeping one’s “bat on the shoulder” is a skill… there are many, many bad baseball players who swing at bad pitches that result in week contact and bad outcomes. Why is swinging at those “better”? If I’m interpreting Dan’s complaint correctly, it’s because not swinging at bad pitches will slow the game down and fans, at least those with Dan’s mindset, don’t like that. So, faster, sloppier, lower scoring baseball is better for the game. Got it. To each their own. I’d focus on time BETWEEN pitches, coaching visits, and time it takes for multiple relievers to get in the game. The assertion that walks are only about the pitcher and that the batter has little to no control over his own walk rate is unsupported by data. In fact, the best data we have suggests strongly that players have a ton of control over their walk rates. Plate discipline is a skill. It leads to both getting on base through walks and as others have stated, swinging at better pitches so that the batter can do more damage. Obviously, players tend to struggle even when they make contact on pitches outside the zone. Maybe, just maybe this hard-headed front office is getting it. I will not hold my breath. Stand vigilant Red’s fans. I’m really not concerned with power. I’m more concerned with OBP, much more. I remember an old baseball pundit even stating one time, “A home run is the biggest killer of a rally.” As far as I’m concerned, while it would be nice to have the home runs, we need the OBP so bad that I wouldn’t even concern myself with seeking power. I remember old pundits saying a lot of stupid things, and this is one of them. Teams need both power and OBP. Plate discipline and approach are honed earlier than professional baseball. It takes a confident mature player with a good coach to be comfortable with a 2 strike count against good pitching. Many coaches and pundits still look at strikeouts as the ultimate negative and so many players at a young age and in a pressured setting…..learn to avoid 2 strike counts to avoid that strikeout and go all in at the first semi-hittable pitch. Ted Williams’ first rule of hitting is get a good pitch. I would argue that the 2 pitch at bat ending in an infield popup or 5 hopper to the second baseman is much worse than the 7 pitch strikeout. after all, even the best hitters go back to the dugout 6 out of 10 times. Unfortunately, many advanced players in the high school levels still learn to avoid deep counts because of the stigma of the strikeout. Its hard to undo this at 20-24 years old. The Reds should have some good draft slots and be able to identify those mature advanced hitters. Seems like they found a good one this year. Cardinals 2013 NL Champions. 27th in HR’s, 3rd in OBP. 2014 in the NLCS, 29th in HR’s, 9th in OBP. 2011 WS Champions, 3rd in OBP, 13th in HR’s. Good offenses are built on getting on base. What it looks like is. . . But, would it be nice to have the long ball, also? Sure. Long balls are not the only power points… FWIW, in 2013 the Cards were 12th in MLB for slugging percentage. In 2011 they were 6th in SLG. So, by definition, better than average. They were back half in 2014… so, yeah, there are always statistical exceptions, but it’s betting against the better odds. Schebler leads the International League in OPS. Why not talk about him? I agree. Maybe he’s figured something out. The Old Cossack checked in on the Bats game tonight while waiting for the left coast games to begin. Stephenson in typical form: 2.0 IP, 2-SO & 2-BB. DeShields loves those swing early/swing often bats and loathes those that don’t. Winker is not only hitting in the bottom half of the lineup as normal, he is hitting 7th. BTW…Winker is 1-1 with a line drive single to CF in the 2nd inning. In the 1st inning the Bats had runners on 2B & 3B with no outs and scored a whopping 1 run on a ground out.